Young Leaders’ Society is for professionals who are passionate about community involvement. Our members bring more than energy and professional stature: they are leaders with a vision for their future and our community. Full of enthusiasm and energy, they know that collectively they can drive great community change. 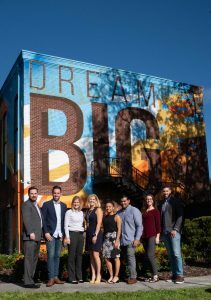 Young Leaders’ Society fosters the participation, commitment and growth of philanthropic-focused professionals in furthering the mission of United Way Suncoast with a special focus on adult financial stability issues. Come together with like-minded individuals to make a positive impact through volunteerism, advocacy, and philanthropy while developing community leadership skills. For more information, contact yls@uwsuncoast.org. *YLS is an affinity group of donors who invest $500 or more annually in United Way Suncoast to fund education and financial stability initiatives to ensure every person in our community has the opportunity to achieve their full potential.